We may be used with the Sun being single, but binary and multiple stars are pretty common in the Milky Way: half of the stars in our galaxy have one or more companions. Besides looking cool in epic space movies, these systems are brimming with exciting (i.e., poorly understood) physics. Some of them have partners very close to each other, up to just a few astronomical units (AU — the distance from the Sun to the Earth). The closer two stars are, the more they interact, and, because of gravity, one may end up ingesting the atmosphere of the other. 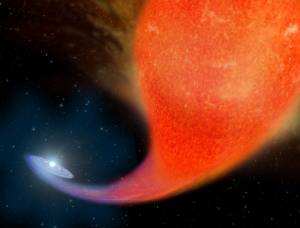 In today’s bite, we discuss how this stellar cannibalism can explain some unexpectedly young stars recently uncovered by monitoring surveys. Is this their secret to a longer youth? In the 1950’s, the astronomer Allan Sandage discovered that some stars in globular clusters appeared to be bluer than expected, so much that they looked younger than their siblings. Thus, they were named blue stragglers. Later studies found that the best explanation for blue stragglers is that they are binary systems in which the less massive component, which evolves slower, ended up accreting the atmosphere of a more massive companion that were on the red giant phase (if you want to dive into the gory details of how they are formed, I suggest reading Chris’ astrobite). By gobbling up this material (in a process formally known as mass transfer), the less massive star gains more mass, becoming thus bluer, and absorbs material produced by its companion during the red giant phase (enriched in carbon and other α-elements). Identifying blue straggler stars (BSS) in clusters is easy, because they stand out among their siblings, but the same cannot be said for field stars — those who are not associated with a cluster. However, it has been shown that BSSs are more common in the Galactic field than in clusters. The authors of today’s paper selected 13 curious and unexplained targets from a specific population of the Milky Way, the thick disk stars, that seemed to be younger and richer in carbon and other α-elements than expected (let’s call them Y stars). Then, they looked for signs of binarity in their radial velocities (the same method that people use to look for exoplanets) in order to confirm the nature of these objects. They also analyzed 13 “old” stars, with no apparent enrichment in α-elements, which function as the control group of the sample (O stars). Massive objects orbiting each other have periodic variations in their radial velocities, so this is a good method to infer the probability of being a binary system. The authors show that 46% of the sample of Y stars has a high chance of being binaries, while only 15% of the O stars are likely to be binaries (see Fig. 1). Moreover, the chemical composition of the atmospheres of the Y stars shows that they tend to be more massive, and the ratios of carbon over nitrogen are consistent with pollution by mass transfer from a red giant star (the blue straggler phenomenon). These two results hint at binary systems playing a role in the occurrence of Y population — stars that seem too young and are enriched in α-elements — in the thick disk. Histogram of stars in function of their probability of being binary. 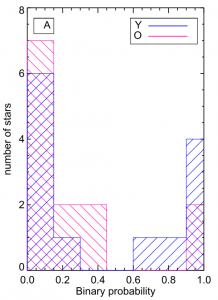 The Y stars (blue bars) are more probable of being binaries than the O stars (pink bars). In order to do a sanity check in their results, the authors perform a synthesis (much like a simulation) of the stellar population, which includes a 50/50 chance that stars are in a binary system, and also allows for mass to be transferred between close pairs. They find that, even though they did not allow for single stars with mass above 1.2 solar masses in the first place, the synthesis produced a number of these stars, which means that mass transfer between binaries is able to produce more massive stars (see Fig. 2, upper panel). 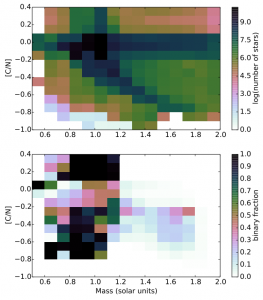 Another prediction of the synthesis is that stars above 1.2 solar masses are mostly single, which means that some of the binary systems merged (see Fig. 2, lower panel). Distribution of stars in the stellar population synthesis in function of their masses. The darker colors mean higher number of stars (upper panel) and higher fraction of binaries (lower panel). [C/N] in the y-axes is the fraction carbon over nitrogen ratio. The recently discovered field stars that belong to the thick disk and that seem to be too young are difficult to explain without invoking alternative evolution paths. In today’s paper, we learned that a viable explanation for their occurrence may be the blue straggler phenomenon — essentially, stellar cannibalism. Most of these stars in this study’s sample are in binary systems, but the authors go even further and propose that the single ones could be the result of merging binaries. Although these objects are difficult to identify outside star clusters, the new instruments and methods we currently have are providing great opportunities to study them, and we are uncovering some the most fascinating pathways of stellar evolution the universe can yield.